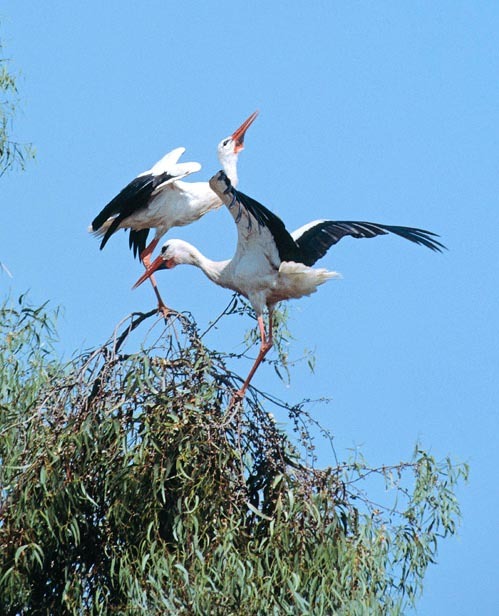 The Storks, genus Ciconia, are big wading-birds, differing from the other European species due to the big size of the long, pointed beak, which, in the mean time is robust and massive. For the rest, they are birds fairly similar to the Herons, family Ardeidae, but all parts of the body have a seemingly greater solidity and, among them, especially the neck, which is clearly more robust. Furthermore, in the legs, the back toe, instead of being placed at the same level of the other toes, it is clearly inserted higher up. Even easier is, for the ornithological biologists, to recognize the flying storks form the herons, as, while the first ones fly with outstretched neck, the second ones keep it close to the body. In Europe, there are two species of storks, the White, or European, stork, we shall treat in this text (Ciconia ciconia Linnaeus, 1785) and the Black stork (Ciconia nigra), similar to each other, as per size and shape, but easily distinguishable for the colour of their livery. Also the behaviours are quite different between these two species which are, however, phylogenetically similar, especially towards the human being. The White stork (Ciconia ciconia) is a species afferent to the class of the Birds (Aves), subclass Ornithurans (Ornithura), superorder Carenates (Carenata), order Ciconiiforms (Ciconiiformes), family Ciconids (Ciconiidae), and genus (Ciconia). The white stork is by far the most known species of the genus. These birds are extremely resistant flyers; they make long seasonal migrations, moving in ample inverted V formations. They spend the summer in central-northern Europe, where they nidify, and then move, in winter, to their winter quarters, I Africa. 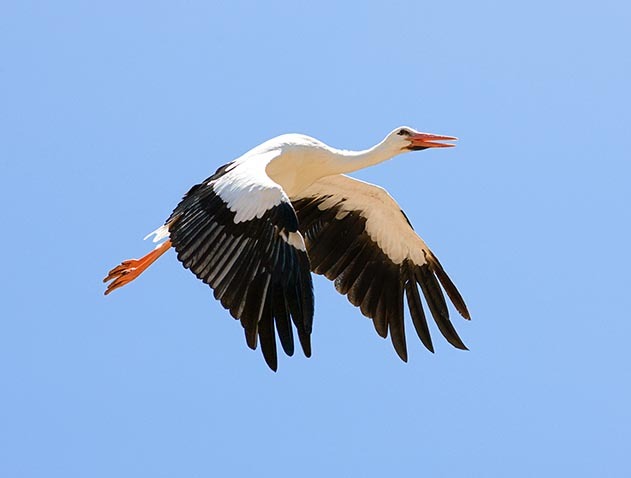 The biologists have, since now some decade, confirmed that the storks, in the specific the white stork, migrate to Africa not for avoiding the cold of the European weather, which they might quite well stand (as testify the specimens kept in open air in the zoological gardens), but for getting the food in sufficient quantity. This ornithic species is found usually in the open fields, close to ponds, bogs and reeds wet areas as well as in the urban centres; in Africa, it is not rare to see it also close to the savannah where small water bodies are present. This species has been noted, since the ancient times, for the familiarity it has with the human dwellings. For building up its huge nests, in fact, it prefers the roofs and the chimney pots of the houses to the trees. This habits it has, united with its proved conjugal fidelity (it’s in fact, a monogamous species, at stable couple, which dissolves only with the demise of one of the two partners), to the perseverance with which, every year, comes back to the old nest and to its activity of hunter of armful to humans animals and the agriculture, has, since always, made it well accepted by the man, who, always, has considered as good omen its presence on the roof of his house and its killing criminal. Also from the ethnologic and of the legends point of view, this bird is associated to the birth of the babies, that is, to auspicious events. Presently, the inhabitants of the northern European countries, in particular the Dutch and the Germans, tolerate not only the presence of the storks on their houses, but even favour their establishment placing on the roof cages or tyres, for facilitating the construction of the nests to these birds. And during the last years, also in Italy, France and Spain an analogous phenomenon is taking place. These splendid waders, furthermore, are much sociable and easy to domesticate if breed since young; but they do not resist to their inborn instinct of the migration which leads them to fly away in autumn, for joining the vast groups of wild storks. However, with the good season, they invariably come back to their departure point and prove to be happy in resuming the domestic life by showing their joy with hard noises they produce by what the Anglo-Saxon ethologists call “bill-clattering”, done by utilizing their big red beak. The same sound is produced each time the male comes back to the nest, after having recovered some food; in fact, the stork cannot emit cries being dumb. It’s a practically omnivorous species. It nourishes of amphibians as well as of fishes, aquatic and terrestrial invertebrates, big insects, reptilians such as lizards (when in Africa, also newly born crocodiles) and small rodents, integrating the diet with berries, seed and shoots. It also eats carcasses to be stripped of the flesh, and in Africa, it is not rare to see them around big dead vertebrates, after having driven away also the fearful vultures. The plumage of the white stork is, rightly, white on almost the whole body, but an ample black stripe is evident on the coverts and the flight feathers. On the contrary, the legs and the beak have a nice bright red colour. The total length reaches the metre, of which almost 20 cm belong to the beak and about 25 to the tail. It does not present characters of sexual dimorphism. Both parents of this ornithic pair dedicate assiduous homoparental cares to their progeny. When spring (March-April) comes, both parents build a huge nest, with a diameter up to 1-1,5 m. In open country, they utilize, as support, a tree or a rock, otherwise, as mentioned before, the chimney-pods, the roofs of the houses and even the pylons of the electricity network. The nest is formed by small branches, twigs and mud. The female lays there 3-4 big eggs, of a dirty white colour, which are incubated by both parents for 35-38 days. After the hatching, the male and the female as well take care of the progeny, taking care of their nourishment. The nidicolous young learn to fly when about 70-75 days old. The IUCN indicates its status as of “minimum risk”.